CLASSICAL DISCOVERIES: Marvin Rosen, host of the “Classical Discoveries” program, in the WPRB studios at Princeton University. 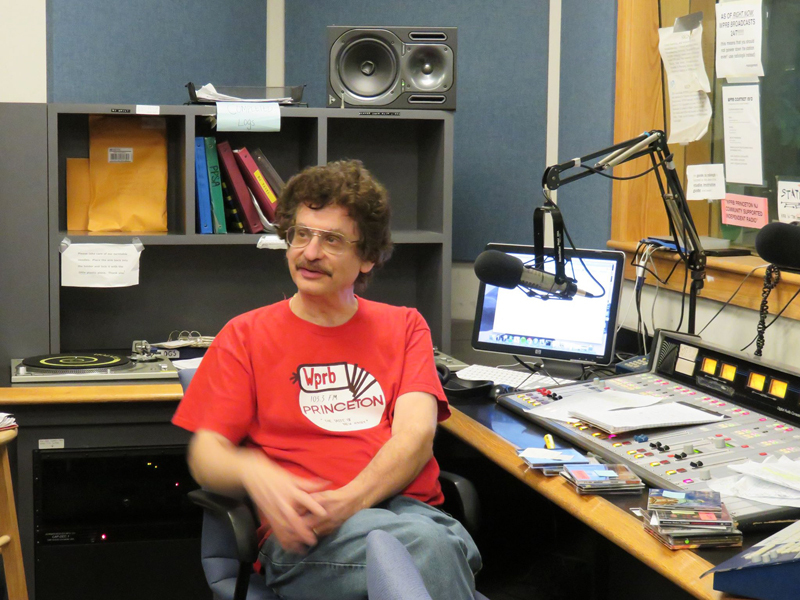 Mr. Rosen is the host of “Classical Discoveries” on WPRB (103.3 FM), which celebrates its 20th year on the air this month. The well-loved radio station, housed on the campus of Princeton University, is student-managed, and while most of the DJs are students, some, like Mr. Rosen, are community members. Mr. Rosen’s show implicitly raises questions about what we mean when we speak about “classical” music. Is it a period of music — a cohort of composers wedged between the Baroque and Romantic eras? Does it necessarily come from “the West”? In what settings is it performed, and on what instruments? Mr. Rosen readily acknowledges that, as a label, “classical,” comes with the baggage of listeners’ preconceptions. “Why don’t we call it concert music?” he suggests. Still, for the sake of the show he sticks with the term because, “you want to try to expand the people who listen to classical music.” The name is a way for him to get people in the door. A similar instinct to not scare off listeners informs the way Mr. Rosen puts together his playlists. “I never wing it,” he avers. His weekly show starts on Wednesday mornings at 5:30, and given the hour, he says he likes to “start a little slow.” He structures each show around several major works, and he is careful to ease his audience into the more challenging programming, saving any electronic or avant-garde works for the end of the show. “But it’s always stuff that’s listenable,” he assures me. Throughout our conversation, Mr. Rosen emphasizes that his show is a “pair effort” made possible with the help of his wife Beata Rzeszódko-Rosen — whom he met, appropriately, because of their shared love of the music of the 20th-century American composer Alan Hovhaness. She runs Mr. Rosen’s website and publicizes his shows on social media. She is up with him at 3:30 a.m. on Wednesdays, making sure he gets to the studio on time, a sack of CDs in hand. Zena Kesselman, a WPRB student DJ and former station manager, agrees that it really is Team Rosen that puts on “Classical Discoveries,” remarking that Beata often comes to all-station meetings with Marvin and keeps station members on their toes with tough questions. “Classical Discoveries” will celebrate its 20th anniversary on May 29. Mr. Rosen will share listener comments and some of his own recollections of his favorite broadcasts, and he plans to revisit some of the first pieces he played on air. Marvin Rosen’s show “Classical Discoveries” airs Wednesdays 5:30-11 a.m. on WPRB (103.3 FM) and streams online at wprb.com.